Des Moines Western Suburbs’ Business Journal and Des Moines’ Northwest Suburbs Business Journal are the only business publications mailed to businesses in these communities every month — for FREE! That’s right. We mail a free subscription to each of the business addresses. Additional copies are also available in key locations, and the information is fully accessible online for free. 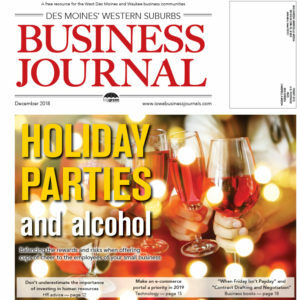 The Business Journals are packed with useful information such as columns on legal advice, tax tips and human resource questions/answers, as well as beneficial business data mined from a variety of local sources that is a “must have” for business owners and sales professionals. You will also find a variety of feature stories focused on local content that is relevant to small- and medium-sized businesses. The publication is printed in beautiful full color on a high-brite paper in a tabloid format. If your business needs to reach other businesses, then this is the marketing solution for you! Contact Jolene Goodman today at (515) 953-4822, ext. 319 or email jolene@iowalivingmagazines.com for more information or to place your ad. Published by Big Green Umbrella Media, an independent and locally owned publishing company.